One of the best locations for fall color in Rocky Mountain National Park is the Bierstadt Moraine are near Bear Lake Road. Aspen tree's line the hillsides here and its very popular with photographers and hikers alike during autumn. 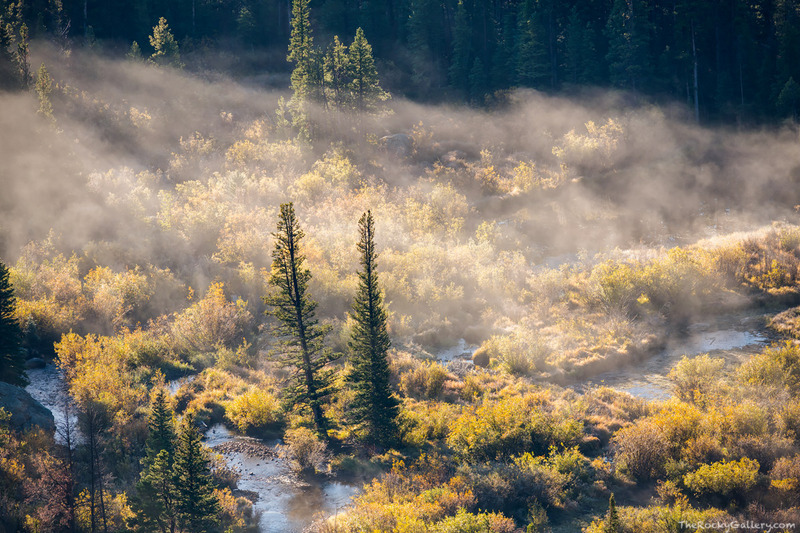 This morning I was hiking back down the Bierstadt Moraine after photographing the aspens at sunrise only to find low hanging fog blowing through pines and willows along Glacier Creek far below. I quickly got setup and captured a few images before the fog burned off as the sun filled the valley. The location down far below me is also popular with photographers and visitors to Rocky Mountain National Park. Many line the banks of Glacier Creek here for a striking image of the continental divide with Glacier Creek winding though the foreground. My good freind and fellow photographer Erik Stensland has made many a striking image from the location below helping to make it one of Rocky's most iconic locations. It's also the first location I met Erik back in 2004 so I figured the location is well deserving of the Stensland name in honor of all the great work Erik does as the preeminent photographer in Rocky Mountain National Park. Photo © copyright by Thomas Mangan.